Description: Fishers are long, slender animals with short, sturdy legs and strong clawed feet. They have long thick tails, small, round ears and pointed faces. Their coat is brown, varying from tan to almost black in colour, darkest on the rump and tail, and may have paler patches on the throat or chest. Fishers often have “grizzled” heads where lighter coloured hair mixes with dark hair, giving them a paler appearance. Males are much larger than females, weighing around 4.5-5.5kg (10-12 pounds) while females weigh about 2-2.5kg (4-5 pounds). Males can be 90cm (36 inches) long in total or more. 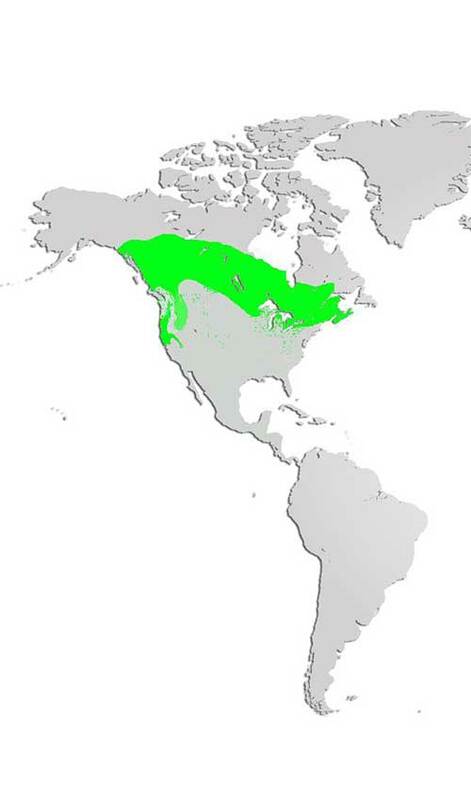 Distribution and Habitat: With the exception of Newfoundland and Labrador, fishers can be found throughout eastern Canada, southern Alberta, and Saskatchewan. They are also found in the Rocky Mountains as far south as California, and in the Appalachian Mountains of the northeastern United States. Historically, fishers were heavily trapped for their fur, but have been successfully reintroduced in many areas. Populations are low but stable in mainland Nova Scotia. They are not found in Cape Breton. 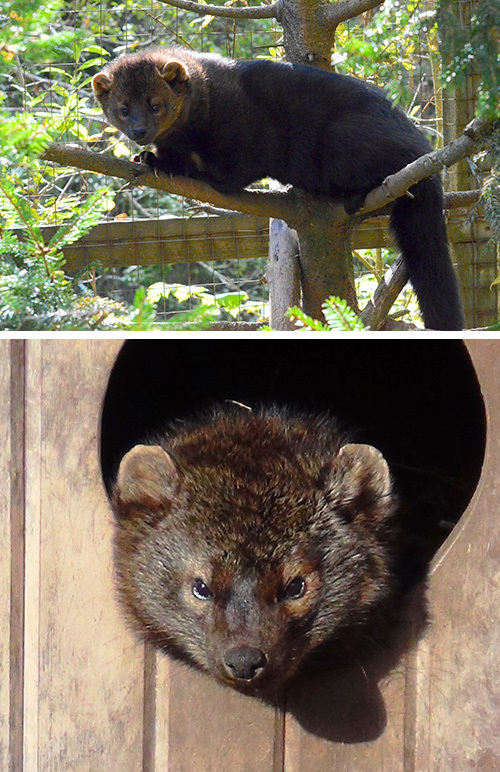 Fishers live in coniferous or mixed wood forests with lots of tree cover, and hollow trees or logs to den in. Diet: Mainly carnivores, fishers prey mostly on small mammals like mice, squirrels, voles and shrews. They will also hunt larger mammals like snowshoe hare, game birds, and mink, as well as otters, fawns, bobcat kittens and young fox. Insects, fruits, berries, nuts, and carrion are also eaten. Fishers are particularly skilled in killing porcupines. Attacking the quill-free face repeatedly until the porcupine is too injured to defend itself, the fisher will then flip the porcupine over and attack the vulnerable underbelly. They can even manage this assault while the porcupine is in a tree. Life Cycle: Fishers mate from late March to early April but due to delayed implantation, the litter (of kits) is not born until early the following spring. Eggs are fertilized immediately following successful copulation, but do not attach to the uterus until the following January. One to 6 young (average of 3) are birthed in March or April, after which the mother will once again mate. Female fishers care for their helpless young in a den with the kits’ eyes opening at 7 weeks. They are weaned between 8-10 weeks of age. Kits follow the mother throughout the summer and are independent by the fall. They have few natural predators although coyotes, wolves, great-horned owls and eagles will occasionally hunt them if given the opportunity. The average life span of fishers is 4-8 years in the wild. Adaptations: Fast and agile, fishers are deadly hunters on both the ground and in the trees. They have strong claws and can rotate their hind feet almost 180 degrees allowing them to climb down trees headfirst. Like all members of the weasel (Mustelid) family, they also have a smelly musk that they use to mark their territory and deter predators. Did you know? Despite their name, fishers eat very little fish if any at all! They can swim but prefer to be up in the trees. The fisher name came from European settlers who believed these animals resembled European polecats. The Old English word for polecat was "fiche" and in Old French they were "fissau". These eventually became “fitchet” among the early settlers and fur traders, mistakenly adapted into the English word "fisher".